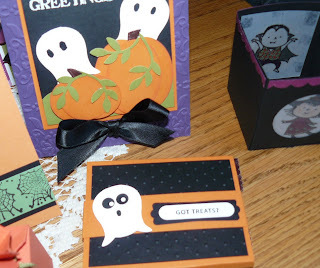 For this week's Blogger's Challenge, we had to use the Halloween theme! Well, I haven't made a card as I'm not a big Halloween "celebrator", but I did make 75 Teacher Appreciation favors this week for the Middle School PTO! Check them out! No wonder I didn't have time to get anything else done! The photos below show a couple of other favors that I did -- I also purchased some self-adhesive foam accents for some of the wrappers that you'll see below. All in all, I had at least 20 hours into this project, with a great deal of the credit going to a good friend of mine that is recuperating from a major surgery, so she welcomed the projects to keep her busy! Thanks Grace! Now, if I had unlimited time and card stock, I'd probably try to do this for the neighbors too... oh well! That doesn't look like it'll be happening! Fall "Flowers" -- No Stamping Here People! I've been so inspired to share some photos that I took this week -- a gorgeous display of color here in New England! I've been busy preparing for a guest designer spot and also the Royal Blog Tour, so I don't have any stamping to show you, but thought you'd love a glimpse of the colors I've captured here! The first photo is what I see when I step outside my front door -- there's color everywhere, but this particular group of colors highlighted the most contrast. Isn't it fabulous?!! The other two photos were taken when I was visiting a friend of mine! She lives across the street from a gorgeous tree -- I wouldn't normally include a photo of a cemetery, but this view was breathtaking IRL! Enjoy! 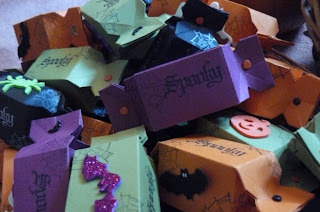 Come back for a Halloween project (a major undertaking!) tomorrow, and have a fabulous day! Hi everyone! I had my Halloween class this week, and boy did I overestimate how much we could get done in 3 hours! We tried to make 4 cards and 4 3-D items (with doubles on the Tags boxes and the Candy Wrapper Treat boxes!). The good news is that everyone had a great time -- the bad news is that they almost all need to come back to finish the projects! Check out the photos of some of the projects below. Above, in the forefront, you can see that I made a small treat holder (you'll have to wait for the dimensions and scoring details -- I don't have one handy right now -- I'll try to post tomorrow or Monday!). This treat holder holds a pack of gum or a treat pack of M&M's -- unfortunately, it was a little too time-consuming and paper-consuming to make too many of these for the neighborhood! Can you tell that the ghost is made using the owl punch and flipping upside-down? Cut off the feet and draw in or use the eyes from the owl punch for eyes and mouth. I dry-embossed the black panel. In the back of the photo above, I made a small T-lite holder -- my sideline sister, Michele, made this and shared the idea/dimensions with me. It's very simple! 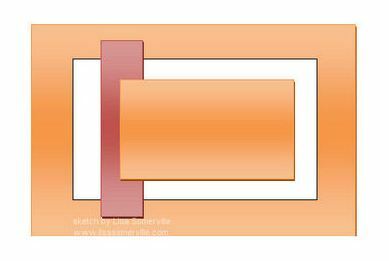 Cut an 8 1/2 x 11 inch piece of card stock in half lengthwise -- it will be 4 1/4 x 11 now. Score at 2 1/2", 5", 7 1/2", and 10". Now, turn your card stock and score at 1 1/2. 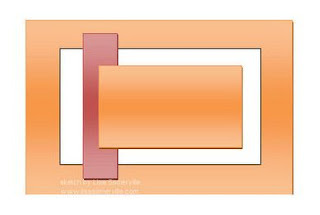 Cut out the small rectangle in the corner (I believe this is the 1 x 1 1/2" piece, and cut on the other scored lines up to your 1 1/2" score line (Make sure you cut the shorter length so you have the 2 3/4" for the height of the sides of your holder. Then, before putting the sides together like a box, stamp a small piece of vellum with your stamp set of choice with Black Staz-on ink, and color with markers once the ink has dried. I punched out a circle with my 1 3/4" round punch on two sides, then glued in the vellum piece -- I prefer the marker side in to make it look like stained glass, but you could also face it out I suppose. 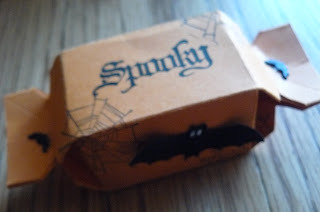 Adhere the sides of your box together -- I think Sticky Strip works best, and insert a small battery-operated T-lite. I purchased mine from W**M*** -- they were 6 in a pack for $2.50! The card above was made using mostly punches -- 3 wide oval punched pieces of card stock and 3 1 3/8" round circles make the pumpkins. Again, I punched my ghost out with the owl punch -- this time I drew in my eyes. The pumpkin leaves were scraps of old olive punched out with the Bird punch. I added a stem of brown grosgrain ribbon. After stamping the Grateful Greetings sentiment in white craft ink, I embossed it with white embossing powder. The Concord Crush card base is embossed with the Vintage Wallpaper folder, and a black satin ribbon bow finishes the card nicely! 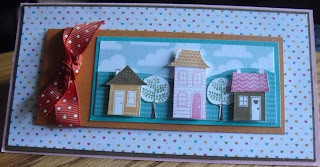 If you recognize this card, you quite possibly have seen it on Stampin' Connection and maybe Splitcoast -- I'm sure I cased it nearly exactly as it's such a great card! On the right in the photo above, you can see my treat holders that I made using the Candy Wrapper die -- I have a close-up photo of the Jack-o-Lantern holder below. 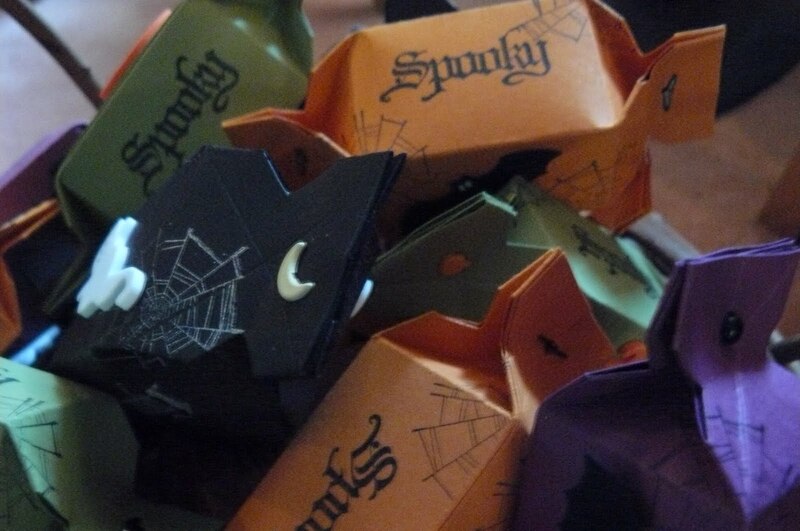 This treat holder above uses the Candy Wrapper die -- doesn't it look just like the milk carton? I made this box by cutting to the score lines on one side of the die (similar to the way I explained the T-lite holder above). Just cut out the tiny corner on one side, cut to the score lines, and fold in. The other side is then the top of the "carton". I used Autumn Harvest to make my face (this also was cased from somewhere on the web! ), I tied a simple bow with some green grosgrain ribbon (Always Artichoke I believe), and again punched out a leaf stem from the Bird punch. Fill it with 4-5 Hershey's Kisses and you're done! This is a most adorable Greeting Card Kids' card -- I just love these gorgeous images! I stamped the image in Black Staz-On and used my blender pen to color it in. The Rich Razzleberry scallop circle is cut using the Scallop Circle #2 Die -- I punched out the round circle with the new 2 1/2" round punch. After adhering the round to the scallop circle, I used a glue pen to adhere some of my Black Chunky Glitter -- isn't it cool?! The card base was dry-embossed with the Big Shot and the Spider Web folder. I adhered some Wicked Fun DSP to the bottom, adhered a piece of Old Olive wide grosgrain ribbon around the DSP, and then added a bow of the new Black Raven lace. I stuck a rhinestone brad in the center of the bow because I couldn't get a glue dot to stick to the lace for anything! I'm pretty sure it was from the Rhinestones Fire pack -- I'm sorry it doesn't show up well in the picture. The last little detail was the punched-out black bat -- I used my white Signo gel pen to make the eyes. This cute little guy above was cased from my sideline, Michele, as well! The spiders are everywhere on the web -- what I cased was the whole card idea! 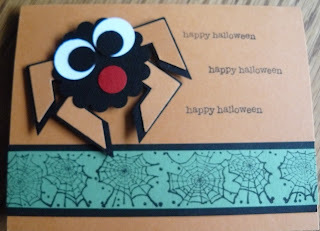 I rolled the Spider Web using the spider web standard wheel on some Wild Wasabi paper -- I then adhered it to a wider black piece of card stock. The spider is punched with the Photo Corner punch -- I was out of Pumpkin Pie paper so he's adhered to Peach Parfait. (I'm actually okay without the Only Orange card stock this year! I didn't think I'd be able to go without!) 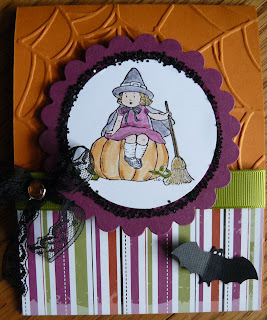 "Happy Halloween" is stamped with the Teeny Tiny Wishes stamp set -- if you know me, you know that I used my Stamp-a-ma-jig to perfectly line up the sentiments where I wanted them!! LOL! 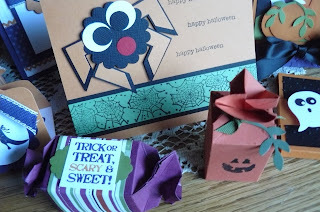 My last creation from the class that I'd like to share are these treat holders made with the Two Tags die -- I purchased a card class tutorial from Chat Wszelaki -- these holders were part of that tutorial. So easy! 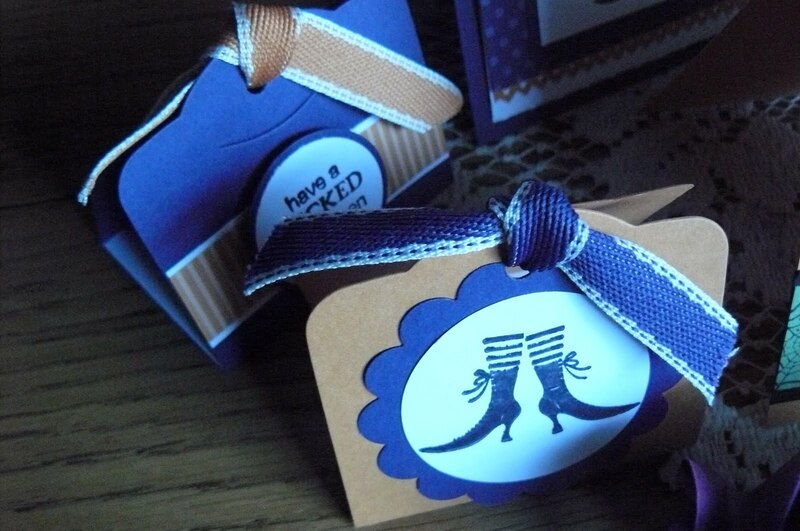 Don't you just love the "Wicked Cool" stamp set images?! I'm still getting used the the texture of the new In Color stitched ribbon. The two colors I used are Concord Crush and Peach Parfait. The DSP are strips from the new In Color DSP stack. Love that paper!! Whew! That's all and quite enough for today! I have a another card that we made that I'd still love to share! Thanks for stopping by! As always, thanks for leaving me a comment!! Hi everyone! Boy, are the days ever flying by! 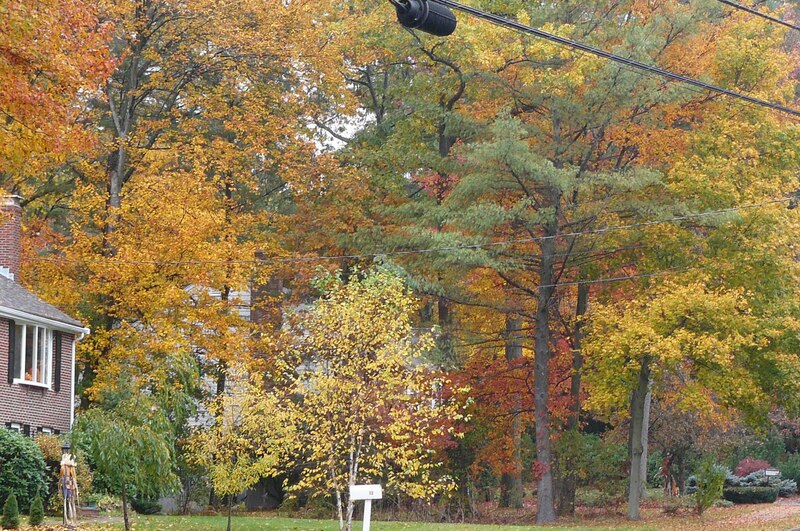 We're probably at peak foliage color here in New England right now, but it will be interesting to see how much color ... how many leaves ... are left on the trees, after the Nor'Easter leaves town later today! 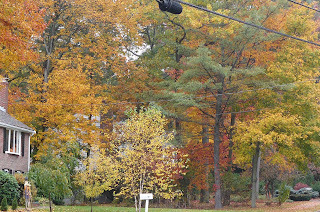 The weather reminds me of many a trick-or-treatin' night here in northern Massachusetts -- wind howling, rain coming down, wet leaves on the road. I can't believe winter is right around the corner!! Stop this wild ride ... I'm not ready for another year to be gone!! LOL! 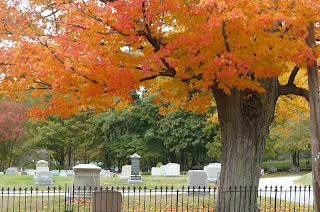 The Blogger's Challenge this week was to use the colors Black, White and Orange. Initially I was all set to bow out of the challenge -- I attempted 3 cards last night and all three of them ended up tossed in the "circular file"! (A girlfriend has laughingly suggested that I put a basketball hoop above my "file" and practice my jump shot! LOL!) This morning, I spontaneously decided to use the Fresh Cuts stamp set. It's been a long while, and I'm not sure where the inspiration came from, but I'm pretty happy with the card! I love the new black rhinestones in the Stampin' Up! mini catalog -- usually I'm a hoarder, but I couldn't resist using these gems! 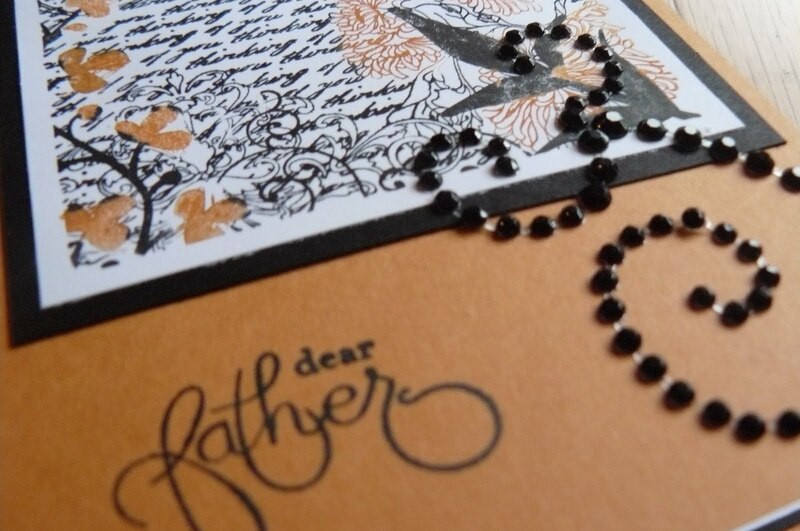 This card, of course as you might have already noticed, is for my father. It's his birthday on Sunday, and once again, the card will be late! 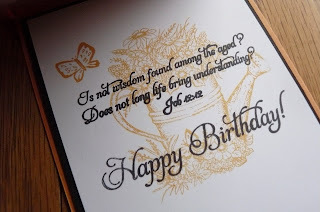 The inside is stamped with an Our Daily Bread birthday stamp set -- I'm thinking that my dad will receive a card with a similar sentiment from my sister, since she's a designer with Our Daily Bread stamps (and very good at it too!). For stamps and supplies, please visit my online store. Thanks for stopping by and leaving a comment! I read and appreciate every single one of them! This week's Blogger Challenge was a sketch challenge. I had a card I needed to make so I adapted my sketch challenge to fit my needs. Pictured below, you will see the sketch. The beauty of a sketch is that you can be as "free" or as "fitted" as you'd like. It's basically a "jumping-off" point that you can adapt to fit a stamp set's image or a need that you have, especially if you just don't know where to start! Above is the October sketch that I used, and you can see the card below that. Do you recognize the stamp set? It is "Good Neighbor" which was a SU Sale-a-bration stamp set last year, mounted in part on a scrap of Welcome Neighbor DSP which was also only available during Sale-a-bration. I knew that this was an adorable stamp set that I would want to keep for my "Welcome Neighbor" baskets that I like to give. I frequently welcome new neighbors with a batch of brownies or chocolate chip cookies, but I'm going to add a small package of handstamped cards and my catalog now too! 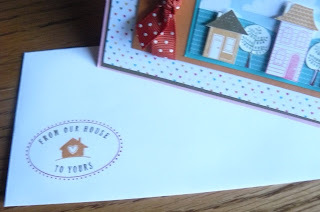 What a great way to introduce myself and my Stampin' Up business I'm thinking! Above is a close-up photo showing the dimension to the houses using Dimensionals. The photo on the right shows the inside of my card. Don't forget your envelope! Shop my online store for all your stamping and scrapbooking needs! 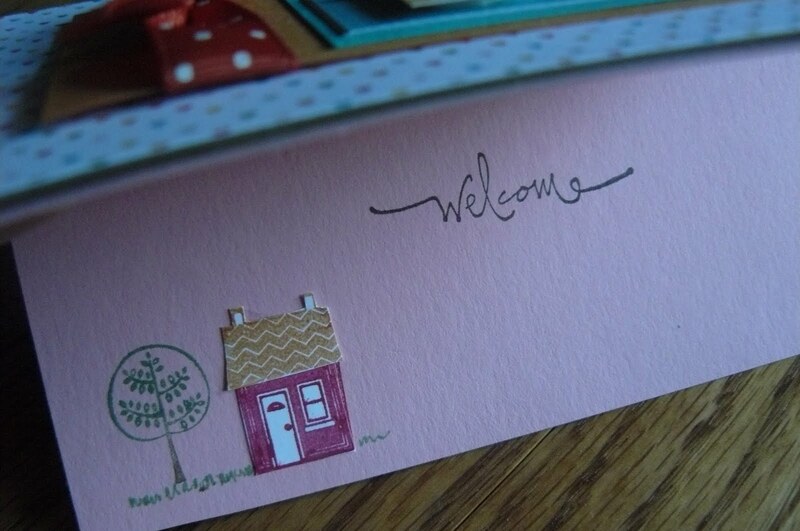 Paper: Welcome Neighbor DSP (retired); Whisper White, Peach Parfait, Bermuda Bay (retired), Soft Suede, Pretty in Pink Card Stock. Ink: Rose Red, Peach Parfait, Soft Suede, Chocolate Chip Classic Ink; markers: Rose Red, Peach Parfait, Soft Suede. Guest Designer for U Stamp with Dawn & Friends! Announcing the Next UStamp Dawn & Friends!! Event …Get a Jump on Your Jingle…Holiday Papercrafting 2010!! I am so very excited to share with you that the next UStamp with Dawn & Friends event will be all about celebrating the Holidays -- Christmas/New Years/Winter. 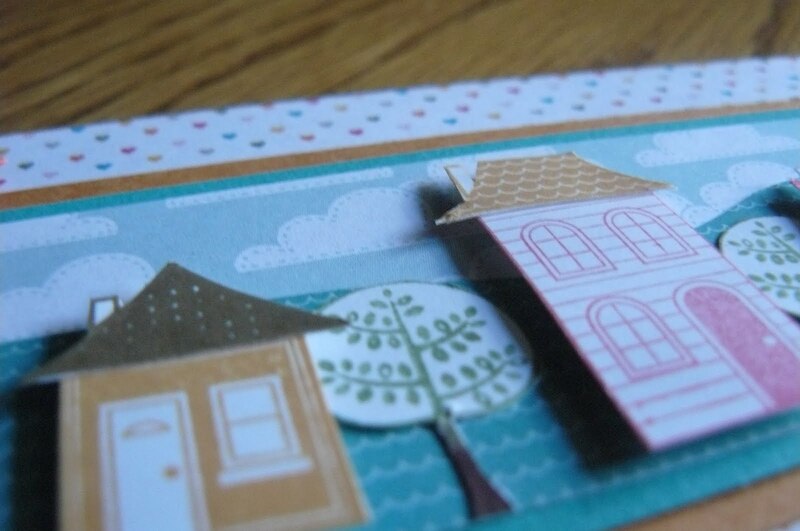 The good news is that I've been chosen to be a guest Designer for this online papercrafting event! I can't wait to share my projects! Would you like to have access to multiple holiday card and gift ideas?! From now until October 8th at 9 am, everyone that leaves a comment on this post will be entered into a random drawing. I can give away 1 FREE Pass to this event. You must leave me your name and email address so that I can notify you in case you win. 2. Purchase a card kit (check out this post for details) -- for each kit you purchase, you get 2 tickets. 3. Place an order on my Stampin' Up website -- for each $10 (before tax and shipping), you get 1 ticket. 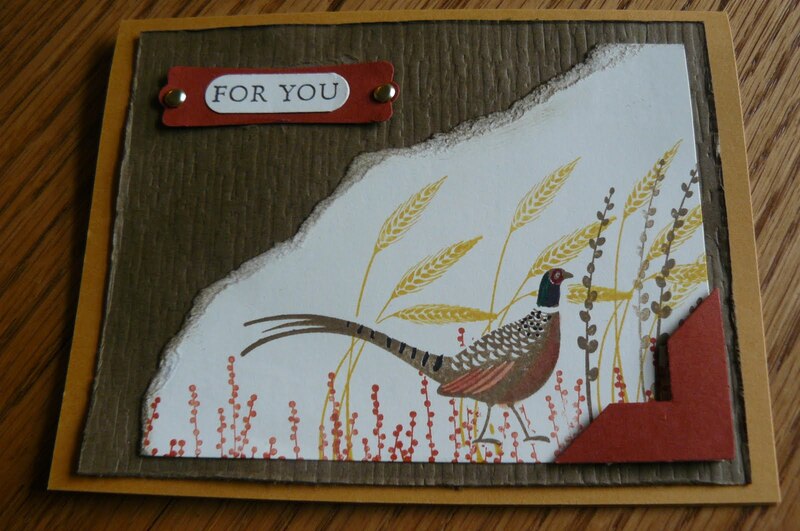 You have until Friday at 9 am (10/8/10) to leave a comment, purchase a card kit , or place an order. I will draw the winning "ticket" on 10/8/10 at 10 am. The winner will be announced here and will also be notified by email (*once again, don't forget to leave me your email address so I can notify you!!). Happy World Card-Making Day! I hope everyone is able to sneak away to stamp for even a moment to celebrate this wonderful pasttime! I know there are several people that are celebrating with very worthwhile, charitable events today. My upline, Marilyn, is hosting a stamping workshop with several other demonstrators across Massachusetts to benefit the Making Strides Foundation, which is a Breast Cancer Awareness foundation (since it is also Breast Cancer Awareness Month!). If you wish to donate, the link is HERE. If you live in the Boston area, you can probably attend this event which is located at the Hyatt Summerfield Suites in Burlington Massachusetts. I wish I was home to participate in this worthy cause! I believe you can also purchase the instructions for the cards by clicking on the link above if you'd like to donate but are unable to attend. Instead of stamping today, I am in western New York State to attend a very special award dinner this evening in honor of my father-in-law. 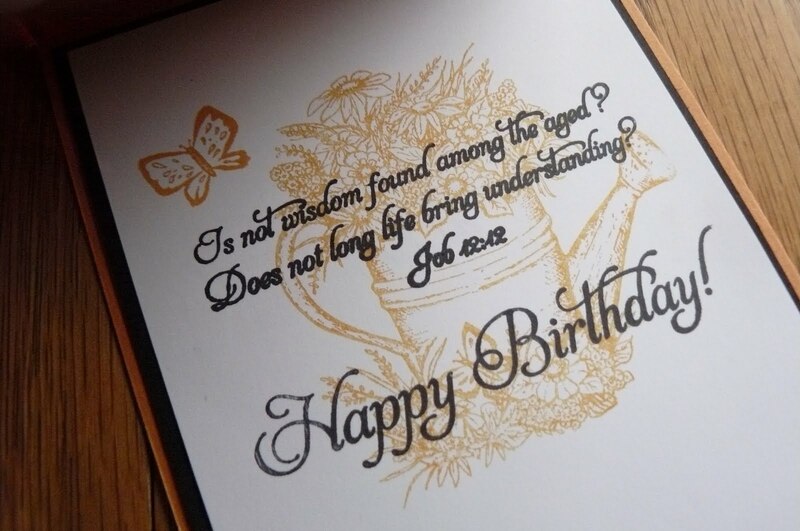 I made two cards for him today, since it is also his birthday today. Happy Birthday Pa! I'm only sharing one card that I made for him though. The other card is my husband's birthday card. Yes, it was my husband's birthday last week and I, as usual, didn't have a card prepared. Yesterday, I was on a roll! I made a total of 4 cards! 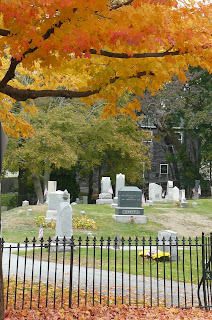 The first one I shared with everyone for my Friday Blogger's Challenge group. I will share the last of the 4 cards early next week when I return home. This is the card I made for my husband yesterday. The recipe below will basically explain the card, but again, contact me if you have any questions. I did rough up the edges of the textured brown since wood-grain is a little bit rough in real life. I should just explain one part of this card. In my sentiment, you notice that I stamped the "For You" and then punched out the sentiment. When I mounted the sentiment on the Modern Label-punched piece, it was too long to fit between the brads. I cut off about 1/4" on each side of the sentiment, then squeezed it back into the Word Window punch in order to get a nice evenly rounded corner. This process works with this punch because the Word Window is even along the length of the punch (in other words, it doesn't work with a punch like the Modern Label because the punch is narrow in the middle, and gradually widens at the ends). You can also do this process to lengthen your word window sentiments, and I will demonstrate that someday soon! Enjoy your day today! I have an announcement to make next week too, so please check back! 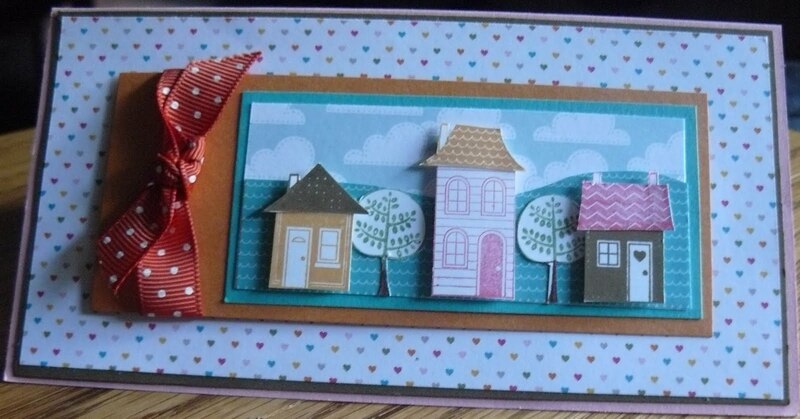 I had a few moments today to participate in this week's Blogger's Challenge -- it's been a little while since I've shared anything so I thought it was time to show you the card I made! 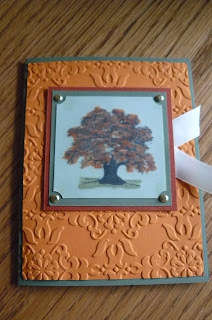 I used the Lovely as a Tree stamp set. With Black Staz-On ink, I stamped on some vellum paper, then colored the image with markers. I then flipped my image over to give it the softer, water-colored look. In order to give it a little more color, I mounted the vellum on a square of Pear Pizazz card stock, then mounted that square on a larger square of So Saffron card stock. I had to experiment a little -- initially I thought of mounting the vellum on some Marina Mist or Bashful Blue card stock to give the appearance of blue sky behind the tree -- that worked until I started thinking that it looked like my tree was suspended in the sky and I just couldn't get past that image in my mind! Using my Big Shot, I dry-embossed a strip of Cajun Craze card stock with the Polkadot folder. 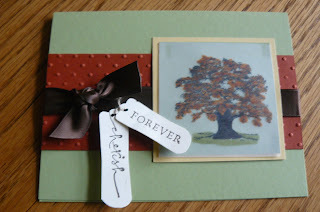 I just love this color card stock for fall cards! 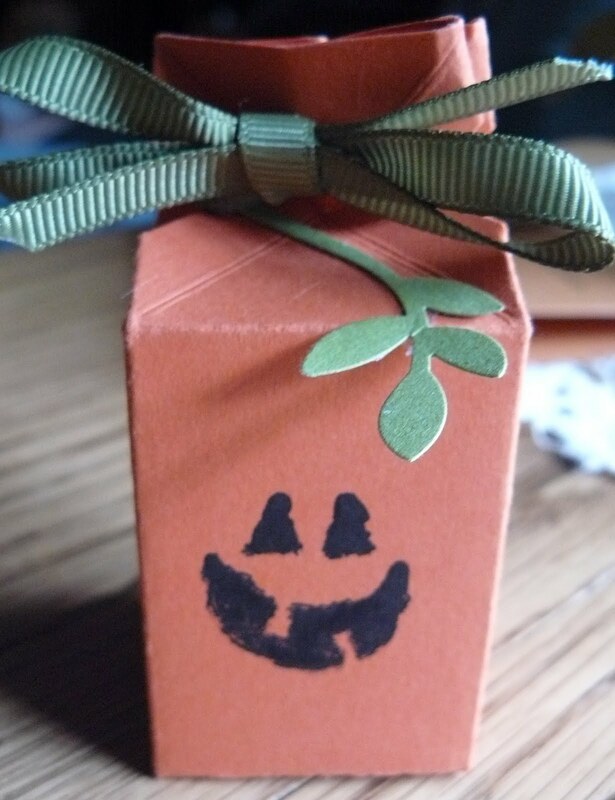 I tied a piece of Chocolate Chip satin ribbon around the embossed strip, then tied to little tags (since this is anniversary!) to the ribbon using some linen thread. 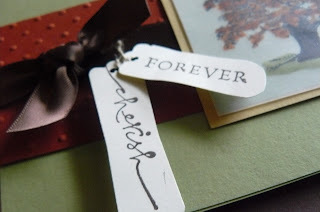 I think the sentiments were from Small Script and Teeny Tiny Wishes, but the "Forever" could have also been from my Fundamental Phrases stamp set. Now... shhh! This card will be for my husband -- how appropriate to make this card this week! 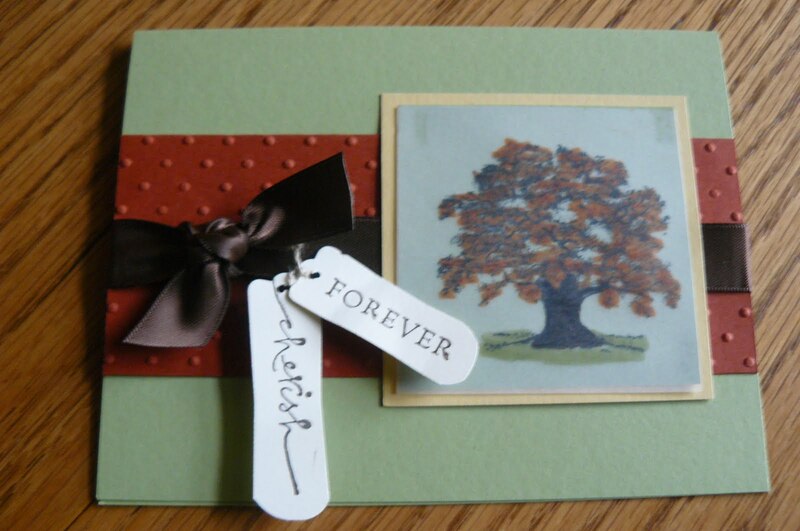 It's our 21st Anniversary on Thursday, and it's about time I have a card made in time for the occasion!! Thanks for looking! Tomorrow, I'll share 2 more fall-themed cards (one uses the same Lovely as a Tree image) in honor of World Card-Making Day! Get out there and stamp!! !